To the Battersea Arts Centre regulars, it is no news that the 120-year-old Town Hall hides the charms that are the very fabric of theatre itself. Other artists have woven the building’s interiors into their works for adults, and the fire damage to the venue this spring has moved the theatre community more than any other similar disaster before. This inventive and inspired collaboration between BAC, Theatre Ad Infinitum, Amy Pitt, Ted Barnes and Amy Pennington is all the more poignant, therefore, in its attempt to animate and plant a genuine affection for BAC’s unique features among the youngest generations of theatregoers. The piece is constructed around three key motifs in the entrance hall – a bee from the blue floor mosaic, a swirly detail from the marble staircase and a cherub with a golden apple from the ceiling. These details come to life in the most unexpected and awe-inspiring ways, providing a neat structure for the 2 to 5-year-olds’ immersive journey. 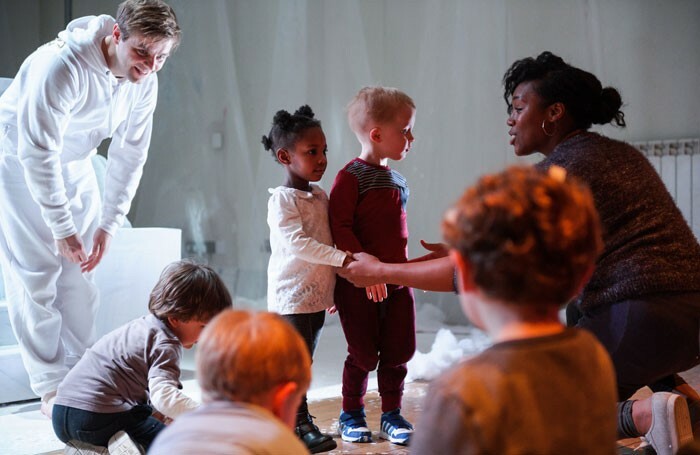 Dealing with the concepts of up and down, the piece takes care of the audience’s key developmental needs, while also allowing them to stay on the move, satisfy their curiosity and get loads of fun wiggling, jiggling and squiggling. If that’s not enough, they are sent home with their own sparkly gift and a memory bound to be cherished for years.